Pride had its official beginnings on June 29, 1985, when the Imperial Court of Nebraska (ICON), a GLBT nonprofit organization, sponsored the first Candlelight Pride Walk along 16th Street in downtown Omaha. The lens of the Omaha World-Herald captured approximately 60 participants as they marched to remember those who had been lost to AIDS. In 1988, the first official Pride Parade and Festival was held in midtown’s Turner Park, sponsored by Bars & Organizations of Omaha (BOO). Shortly after, responsibility for the annual celebration was turned over to Achieving New Gay/Lesbian Endeavors (ANGLE). In 1996, the Festival relocated to the Heartland of America Park, returning the celebration to downtown. In 1997, ICON held the first Pride Pageant during the Festival to crown Mr. Gay Pride Nebraska, Miss Gay Pride Nebraska, and Ms. Gay Pride Nebraska. 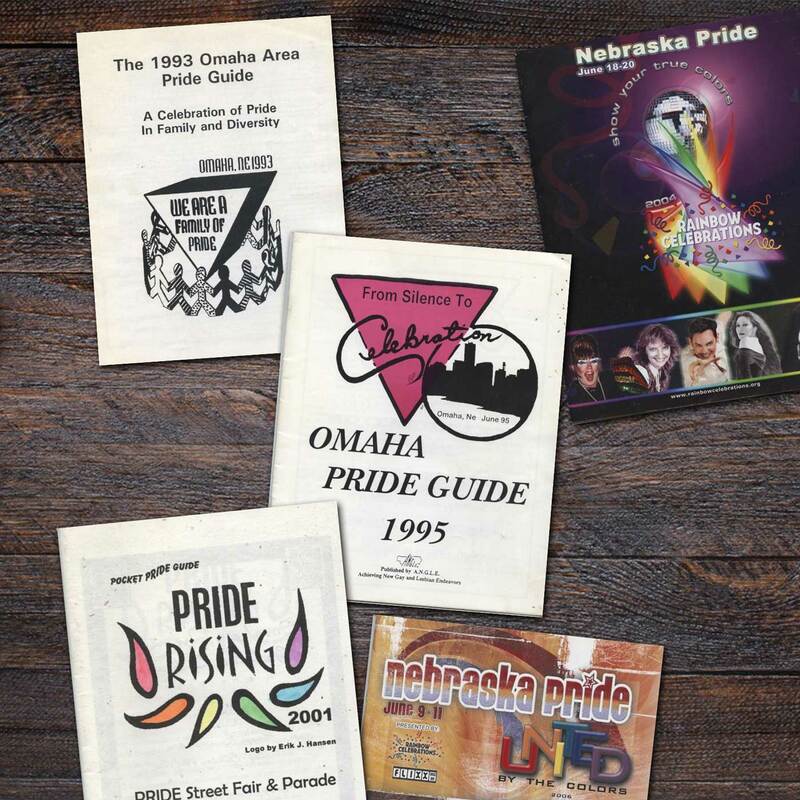 In 1998, Pride Inc. was created as the official sponsor of the Pride Parade and Festival in eastern Nebraska. By 2001, the Festival grew into an all-day event with entertainers, speakers, and the election of Scott Winkler as the first Pride Grand Marshal. Attendance reached over 2,000 people. Later that year, Pride Inc. became Rainbow Celebrations, a nonprofit group with a year-round board made up of volunteers from many GLBT and supportive groups in eastern Nebraska. Rainbow Celebrations took over organizing the Pride Parade and Festival and the National Coming Out Day Celebration. Rainbow Celebrations partnered with the Rainbow Outreach Resource Center for Pride 2002, which saw over 45 organizations and floats in the Pride Parade and over 3,200 attendees. In 2003, the Pride Festival expanded to include several street blocks in downtown, increased sponsorship and vendors, and showcased a professional Pride Stage with singers, dancers, comedians, and DJs. Attendance swelled to over 5,000 during the two-day Festival, including over 20 couples who took part in the first-ever Pride Commitment Ceremony. The year 2005 marked the 20th anniversary for Pride, celebrating with a riverboat cruise, anniversary festivities, and the Spirit of Pride Awards. In 2007, the Festival moved once again to Lewis & Clark Landing to accommodate increased attendance. By 2009, over 9,000 people were flocking to the Festival. The 2010 Parade and Festival marked Omaha Pride’s monumental 25th anniversary with record attendance. Each year has brought more growth, more surprises, and more community to our Pride celebrations. From our humble beginnings in 1985, when we marched to remember our dead and dying, to our present celebrations of freedoms gained and those yet to be won, Pride has grown in attention, respect, and achievements. As we move forward, Heartland Pride, a grassroots nonprofit community focused organization formed in November of 2010 out of necessity to produce a sustainable inclusive Regional Pride will continue to celebrate the many wonderful achievements which have been accomplished over the past decades of LGBT Pride in Nebraska and Iowa! Won’t you come help celebrate? See you there!